If there’s anything that 2018 has taught us, it’s that history of the sartorial variety really does repeat itself. And if anything’s become clear recently (other than a few PVC things in your get-up, that is), these new-breed fashion revivals (like 90s dad style and hyper-bright neon) seem to be dishing out a pretty fresh look upon the past. Among so many new “it” accessories to bubble up this year, one we’d like to back moving into high summer has to be chain sunglasses. Shades have a long, well-understood record of being less about practicality, and more of a statement—2 Chainz, champion of both chains and shades, for example, wears sunglasses at all times and for all occasions. And while a chain affixed to your pricey sunnies might mean less chance of losing them, the real reason you’ll be adding these to cart is simply that they’re damn cool. 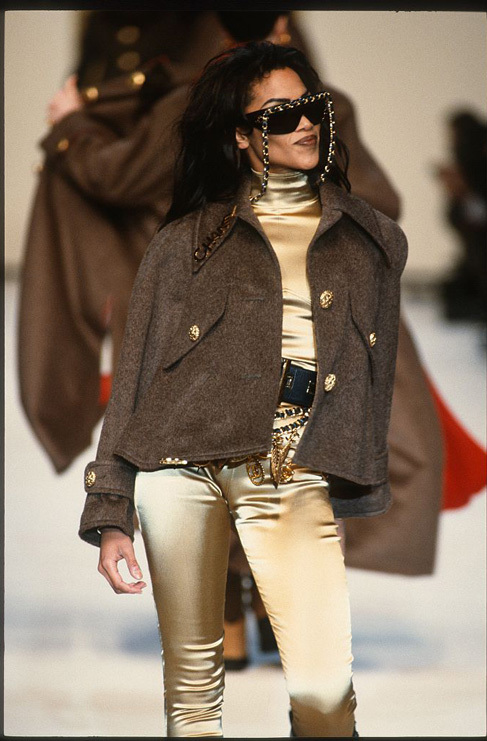 The vibe is early 90s Chanel and DKNY—we’re talking hefty chain mail in gaudy gold, not dainty cords or Dame Edna rhinestones here. Here are a few of our favourite chain sunglasses, both vintage and new, small and oversized. Choose your weapon. EDITOR'S PICK: In a year that was totally overloaded with excellent fashion collabs, London-based designer Alessandra Rich buddied up with luxury sunglasses giant, Linda Farrow for a set of chain sunglasses that are so brilliantly early 90s, when you wear these guys you might as well be Naomi Campbell, Linda Evangelista or the Fresh Prince. Approximately $711 at Farfetch. Why settle for the remake, when you can have the original? These hefty, oversized chain sunglasses are as iconic now as they were in 1992. Since their debut on the Chanel RTW F/W '92 runway, they've been picked up by the likes of Rihanna, Amber Rose and Lady Gaga. Get these collector's items for a cool $2,835 right here. Lucy Folk earned our attention with gilded popcorn jewellery. She also makes covetable beaded cocktail clutch bags. Her gold-plated spin on the sunglasses chain comes with either clips or silicone ends to attach to any pair of shades. $115 at Lucy Folk. 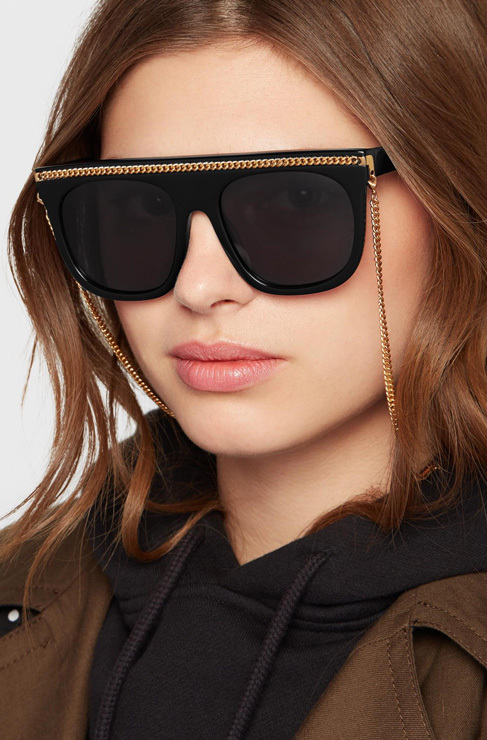 Or, try her Cartouche shades with chain, $534 at Farfetch. Stella McCartney's chain motif runs across most of her accessories—bags, shoes, and yes—sunglasses. Forget that whole tiny sunglasses trend, and make a massive statement with these D-frame chain drop sunglasses. Approximately $560 at Net-A-Porter.